Dr. Anthony Lam Sui-ky, a researcher at the Holy Spirit Study Centre of the diocese of Hong Kong and a leading expert of the Church in China, analyses the "plateau" phenomenon that affects Chinese Catholics. After a great wave of baptisms and vocations, the numbers show a slowdown that keeps the number of the Catholic community stable but stagnant. Catholics are now about 10.5 million. The official and underground Church have the same dilemma and must work together to overcome it. Courtesy of Tripod. Hong Kong (AsiaNews) – Since the year 2000, the Catholic Church in China has been facing a series of challenges. Of these challenges, a downturn in the Catholic population numbers is one of the most significant. The stagnation of Catholic population growth is accompanied by the aging of members in the Catholic Church. That also brings with it a crisis in the number of vocations. In the year 2000, nobody worried about vocations in China. At that time, people were just concerned about how to construct larger seminary campuses to host the ever-increasing number of seminarians. But within ten years, the number of recruited seminarians dropped dramatically. It is interesting to note that the difference between our figure and the official figure remains rather stable. In 1988, when I first suggested that the Catholic population in China should be about 8 million, the government-sanctioned figure was 3.5 million. The ratio between the two figures was 2.3：1. In 2005, when I estimated that the figure for the number of Catholics should be 12 million, the official figure was 5.3 million (according to《中國天主教：第七屆代表會議專輯》2004, p.6). The ratio between the two estimates was still 2.3：1. The above figures reflect that the ratio between the official figure of the Chinese Catholic population and our figure remained stable. Presumably both sides were consistent in using their own method of research. The discrepancy between the numbers was due to some questions, like “a different definition of the open and underground Churches,” “the black market population,” etc. It was good that the Blue Book of Religions (2010) agreed that “the actual number of Catholics in mainland China could be more than 6 million.” It showed that they would like to cope with the reality in a more pragmatic way. The traditional understanding of “the Plateau Phenomenon” is that a community, after rapid development, failed to keep up the momentum. This means that the increase in new members just replaced the number of lost members but failed to achieve any further growth. I took a series of different data, and found that no later than 2000, the Catholic Church in China had already entered into “The Plateau Phenomenon”. If we take the figure of 12 million as a basis, and consider that life expectancy in China is 75.6 years of age, and presume that the average age of baptism is 18, every year the Church would need 210,000 new baptisms to cover the natural losses. This does not include the drainage of faithful to other religions or sects, like the infamous “Oriental Lighting” 東方閃電. The official side of the Catholic Church in China claims that from 2004 to 2010, every year on average, there were between 90,000 and 100,000 baptisms. Together with the figure from the unofficial side, the total number of baptisms might have been marginally good enough to cover the natural losses. For the last few years, however, the average Easter baptisms only numbered about 21,500. The following table presents the figures of Faith Press. Put together with other baptisms during the rest of the year, the official side of the Church may have had around 30,000 to 35,000 new baptisms annually. Compared to the figures of 90,000 to 100,000 baptisms annually in the period from 2004 to 2010, one can see that the numbers for the Catholic population are obviously going down. Considering all the different figures, and especially my findings from some interviews conducted in the summer of 2014, we can project that the Catholic population in China currently numbers around 10.5 million (about 0.77% of the total population). A colleague of mine did another calculation, and found that the number of Catholics in China should be between 9 and 12 million (0.66% - 0.88% of the total population). This figure matches well with my findings. On April 13, 2015, GALLUP International which consists of 75 independent polling organizations, released a report of their research on religion in 65 countries or areas during the period September to December 2014. According to this report, the least religious country was found to be China where 61% of the people claim to be convinced atheists, approximately twice as many as any other country, and 29% say that they are not religious. Just 7% of Chinese citizens claim to be religious. Another data resource which is worthy of our attention is The Religious Landscape Survey conducted by the American-based Pew Forum on Religion & Public Life in 2007. 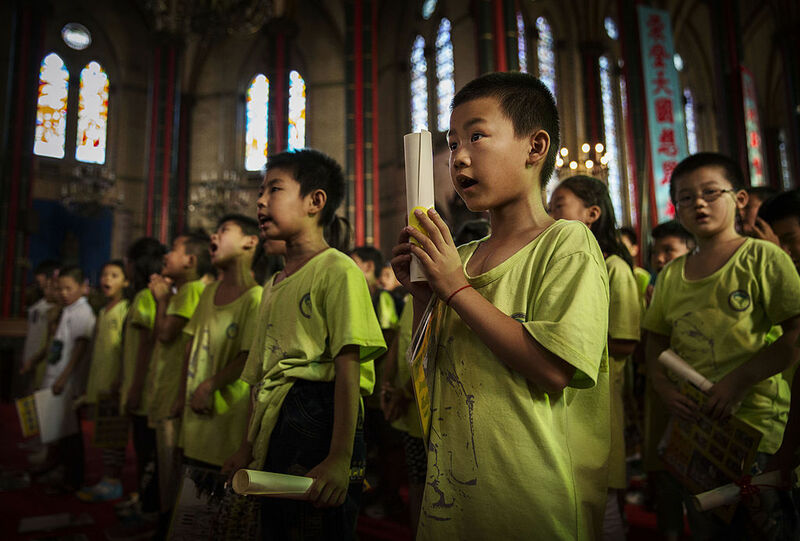 In 2008, they issued their report, which stated that 14 percent of adults in China said that they are religiously affiliated, and that Catholics made up one percent of the national population. According to the GALLUP Survey of 2014, the Catholic population made up just 0.5 percent of the total population of China. The downturn in the Catholic population will directly cause a downturn in the number of vocations, but it will take a few years for the phenomenon to emerge. During the last 15 years, priestly and religious vocations in China have suffered a great loss. The following table reflects the decline in the number of vocations among young men. Now we come to young women's vocations. Their situation is even worse. In China it is not easy to compile concrete figures for the underground Catholic communities. During the decades between 1999 and 2008, the total number of ordinations in the underground communities is estimated to have been around 280. On the open Church side during the same period, the number of ordinations was about 560. On average, about 50 young men were ordained annually. The figure is not very many, but not too few either. What makes the figure worrying is that more ordinations were carried out in the previous years of this century. From 1999 to 2004 on average every year 70 to 80 new ordinations took place. Numbers have been decreasing ever since. As the number of ordinations depends on the number of vocations. The “fruitful” result of ordinations during the first years of 21st Century is just a follow-up to the flourishing of vocations in the late 20th Century. Following the decline of vocations in the 21st Century, we can foresee that the number of ordinations in the future is not so optimistic. Below is the table of ordinations (open and underground communities together), which took place since the year 2000. (1) As the number of vocations is decreasing, the work of further formation for young priests should be strengthened. In the past, seminaries had to cope with a heavy teaching task and no effort could be spared for further formation. Now is the time to fill in this gap. (2) The formation of the laity should be improved. As the number of new priests diminishes, more work in the church communities should be assigned to lay people. Therefore, they need and deserve good training. (3) Late vocations should be encouraged. Recruitment of seminarians is an all-encompassing work. It should not only be aimed at young people. As China is shifting to a middle-class society, more professionals may be re-examining their lives, and maybe considering a second career. Among this group of people, perhaps some seeds of a vocation have been planted. The Church should give them the necessary support by providing them with spiritual upbringing and vocation discernment. 1. The 2012, 2013 and 2014 figures in this table are provided courtesy of China Zentrum.